Carpathia was the first ship to arrive on the scene of the Titanic, saving several hundreds of survivors. This is a completely customized deck. The backs, jokers, aces, card faces and court cards are all a custom design. The deck was printed by USPCC on traditional Bicycle stock with Air-Cushion Finish. 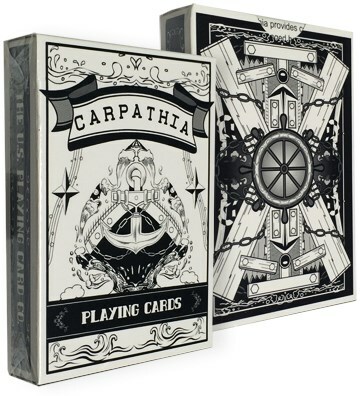 Production is limited to 2,500 decks and they will not be reprinted. You also get 2 extra cards: a blank back card and a double backer card.